Practices – Greater diversity and inclusion in corporate leadership and Boards enhances a company’s culture and its profitability. People – Societal racism enables corporations to become complicit in, or even benefit from, human rights abuses, such as prison labor or forced labor in their supply chains, potentially threatening brand equity. Products – Services or products, such as redlining and predatory lending, particularly targeted at historically disadvantaged groups further exacerbate injustices and risk reputational harm and legal costs to companies. Conversely, beneficial products could garner consumer loyalty and profitable growth. 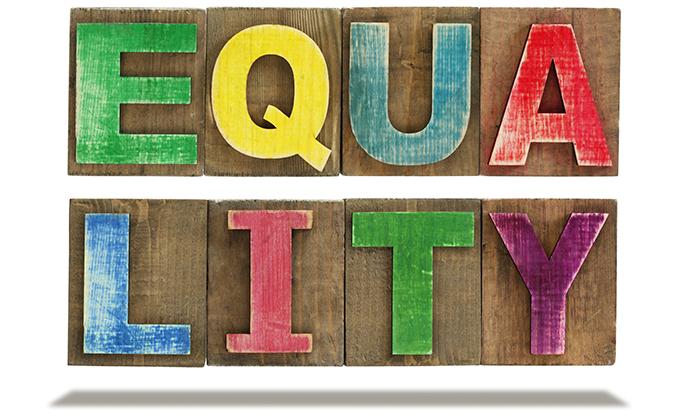 Policies – Companies have the opportunity to create a corporate culture of non-discrimination that supports mentoring, intentionality in inclusion, and pipelines of diverse employees in “line” functions, thereby strengthening their license to operate and business success. Conversely, a discriminatory or non-inclusive environment can cause employee turnover and talent loss, vitiate the work environment and potentially precipitate legal costs or regulatory penalties. The investor case is clear: creating diverse and inclusive organizations is challenging, but the results warrant that pursuit. A 2017 McKinsey study showed that companies with the most ethnically diverse executive teams—not only in absolute representation, but also a variety or mix of ethnicities—are 33% more likely to outperform their peers on profitability. At the Board level, too, high levels of ethnic and cultural diversity are correlated with greater likelihood of above median profitability. Globally, diverse and inclusive workplaces attract and retain top talent, improve customer orientation, decision-making, employee satisfaction, and secure the organization’s license to operate. Work to create the changes we seek by engaging in active, sustained dialogue with companies and encouraging them to create inclusive cultures that do not discriminate or keep people of color from participating fully as employees, consumers, and suppliers. Since our founding, Boston Common has avoided investing in companies that have a history of discriminatory behavior towards women or minorities. 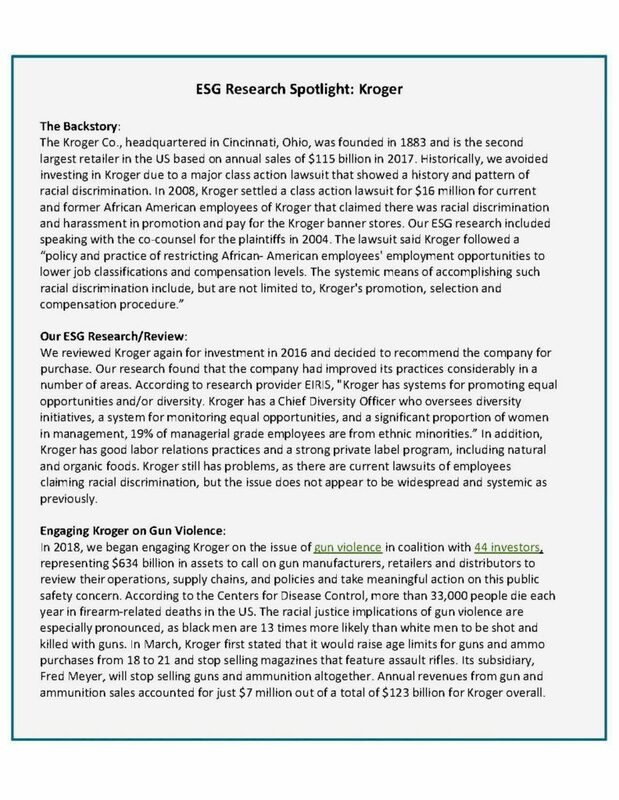 Below, we spotlight Kroger, for example, a company that has, over time, improved its diversity policies and practices to meet our Comprehensive ESG criteria. As a board member of the Thirty Percent Coalition, we encouraged the research firm ISS to share aggregate statistics with us on the number of women of color that have been added to the boards of S&P 500 companies since the creation of the Coalition in 2011. At the time, the 30% target was chosen because of academic research underlying the importance of a “critical mass,” as well as the fact that it was about double the representation of women directors. The good news: times are indeed changing! Today, women directors comprise 24% of the total number of directors in the S&P 500. However, during that same period, women of color directors have gone from only 3% to 4% of all directors. While this number represents significant improvement on a relative basis, it remains a dismal absolute number. In recognition of the need to address diversity beyond gender, Boston Common was the only investment manager invited to attend the inaugural Diverse Corporate Directors Coalition (DCDC) held last month in NYC. This new association includes representation from a broad range of affinity groups focused on promoting an inclusive board diversity agenda and increasing the overall diversity on corporate boards. DCDC will work to advance a forward-looking agenda to shape the leadership landscape of corporate governance as a competitive advantage for corporate America. In December 2017, we co-filed our first shareholder proposal on racial equity at Google. We are asking the company to link CEO pay with the achievement of voluntary targets for representation of diverse senior managers. After receiving over 7% support at the company’s annual meeting this past summer, we will continue our active dialogue with company management. This advocacy initiative was born out of a broader scope of work by a small group of investors, including Boston Common, who began meeting in 2017 to discuss what investing with a racial justice lens would look like, particularly in public equities. In the past year, Boston Common has also joined with groups supporting college endowments (Intentional Endowments Network) and foundations (Confluence Philanthropy) to educate and support Trustees on how to consider diversity, equity, and inclusion factors at all levels of the investment process. The desire among investors to address economic and racial injustice has surged in the past two years with the launch of a number of working groups, networks, and initiatives. Our long history of incorporating considerations of equity and justice into our portfolios helps amplify our voice as we continue to work both independently and collaboratively to engage companies toward making the workplace a more equal, sustainable place. Boston Common Asset Management is dedicated to the pursuit of financial return and social change. Diverse, women-led, and majority employee-owned, we bring experience, intentionality, integrity, and judgment to these tasks. Women comprise 60% of our Board of Directors, 70% of Senior Management, and over 55% of our integrated Investment Team and total staff. Racial diversity accounts for over 40% of our integrated Investment team, 30% of total staff, and 20% of Senior Management. Boston Common’s mission reflects our commitment to our clients, our team, and to the universal commons. Working within the arena of investments, we commit to being responsible stewards of our clients’ assets, seeking competitive financial returns and meaningful social and environmental change. The author, Lisa Hayles is a Principal at Boston Common. She leads shareowner engagement on diversity and inclusion issues, and works with institutional clients.